Traditionally, benefit-cost analysis uses the net present value (NPV) formula, which adds up revenue and expenditures over a period of time and discounts those cash flows by the cost of money (an interest rate). The NPV calculation effectively states the lifetime value of an investment in present terms. 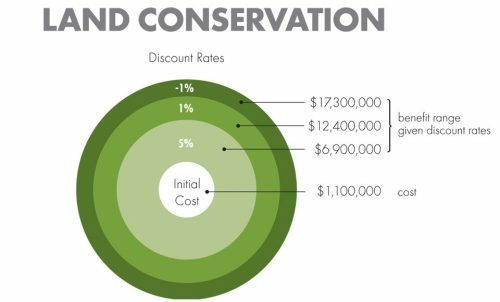 NPV+ expands on the familiar NPV analysis by including unpriced factors, such as the cost of environmental degradation, and benefits like ecological resiliency. In the NPV+ framework, any investment may be a “capital project;” all costs and benefits—even those where no monetary exchange occurs—are “cash flows;” and those cash flows can be evaluated using the NPV+ framework. 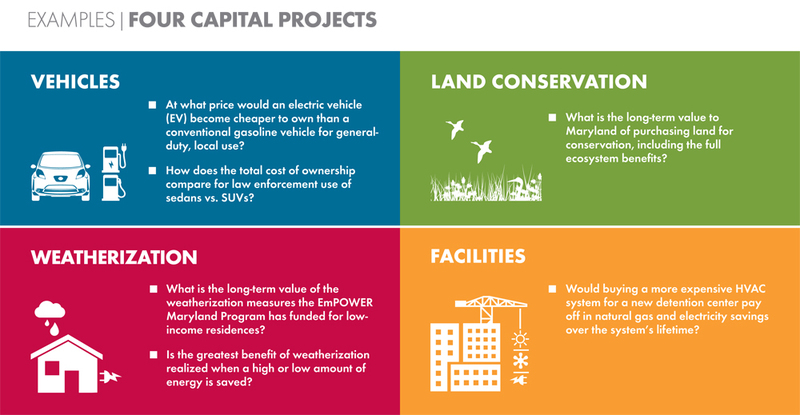 Whether the capital project involves buying vehicles, resource-efficient buildings, land conservation or mass transit systems, NPV+ can provide more accurate and useful guidance on the long-term value of the investment. It is often assumed that economic growth will continue at historical rates for decades to come; that fuel prices will remain affordable and grow at a moderate rate; and that some benefits and costs will continue to be externalized. To create a more realistic context for capital decisions, NPV+ uses scenario analysis to capture possible economic futures. Along with recognizing normally unaccounted-for factors, this approach offers a way to bracket potential future values of investments and obtain more accurate life-cycle accounting with more complete information (hence the “plus”). NPV+ can help policymakers and budget analysts to focus on maximizing long-term wealth and provide realistic guidance in a time of growing constraints, including higher resource costs, changing climate, and historically atypical economic performance. NPV+ was developed with the support of then Maryland Governor Martin O’Malley, the cooperation of Maryland agency staff, and the financial support of the Rockefeller Foundation. NPV+ was used to analyze four types of spending decisions routinely made by the state of Maryland: vehicles, weatherization, land conservation, and facilities. Fast Company: NPV+ is a method of accounting that allows for environmental and social factors, so you know what things actually cost.